Built in, low cost, professional tools to assist transporters of agricultural commodities with HOS compliance when using FMCSA exemption 49 CFR 395.1(k). FMCSA registered Geowiz ELD/AOBRD product registration number #0008. 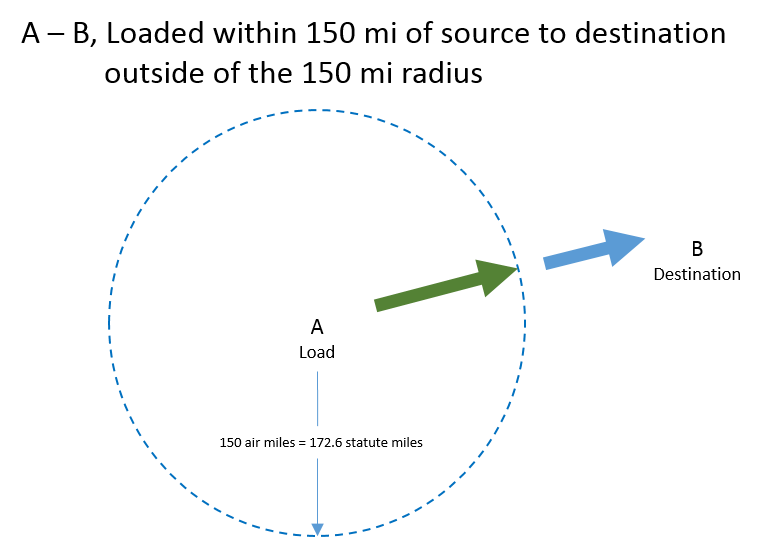 Clearly, visually, and simply identifies sources and radius. Automates HOS compliance and record keeping. Provides FMCSA RODS file transfers, and offers roadside proof of air mile eligibility. Tracks commodity type, source, distance, and season to have available for inspections or audits. Automated tools that track your HOS when required but give you total control in which commodity sources to include. 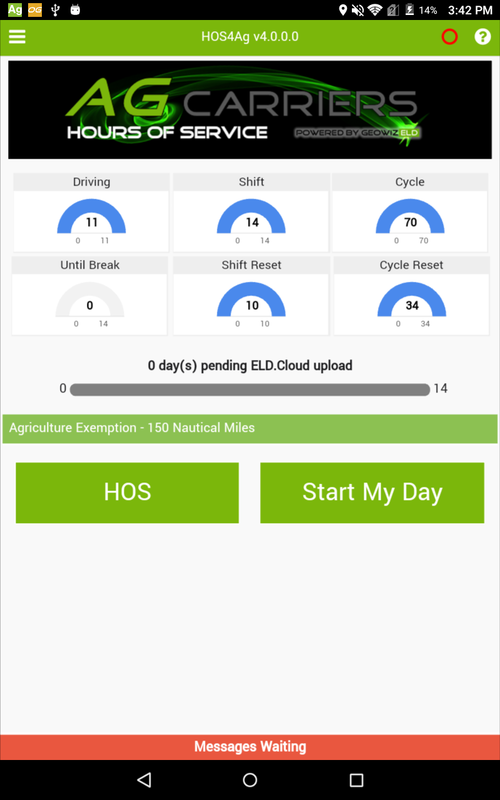 Use to meet your ELD compliance, or use as an HOS log keeper with no engine connection. System handles all of the complex FMCSA Ag rules for you, and provides visual simple tools for easy daily operations, and piece of mind for inspections and audits. Select the plan that is best for you, from low cost single user plans to solid discounts for larger fleets. The unit can run as an ELD or AOBRD. If your truck is prior to 2000 you can run in AOBRD mode without the ELD hardware unit engine connection (discount available). Perfect for farms with a single vehicle or for professional owner operators. All the features of the single user version paid monthly instead of annually. Turn your AOBRD/ELD units into a fleet wide GPS solution and more! Run as an APP Only! 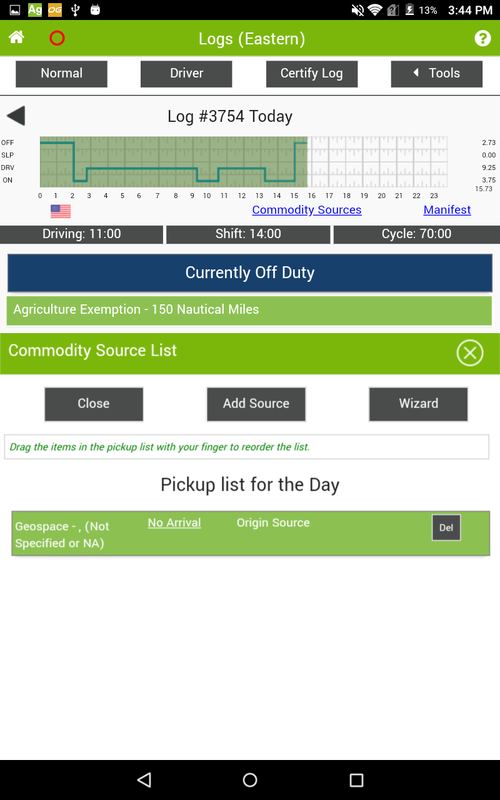 If you have an older truck prior to 2000 that doesn't need an ELD, or, if you have another system but want to track your logs specifically as an agriculture commodities hauler, you can get the APP for a small one-time fee. 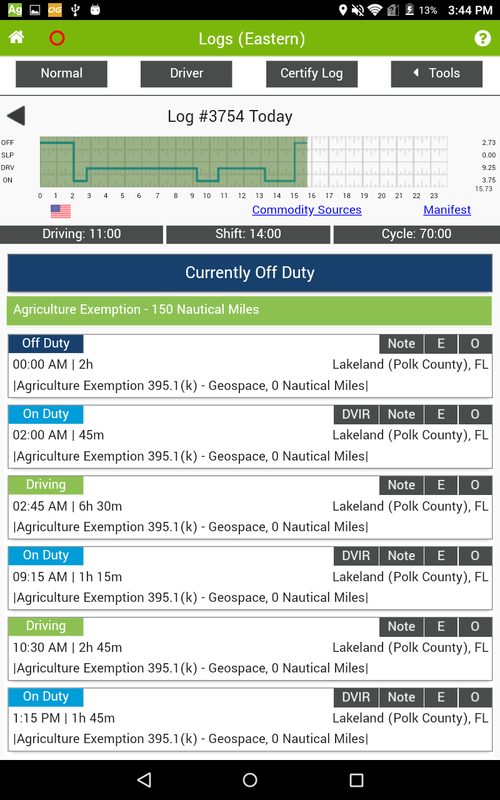 You can upgrade to an ELD at anytime and keep the same APP and logbook data. Add the Web ADMIN for full office functionality whenever needed. Run as a single user, or for only $47 a month turn the individual ELD/AOBRD units into a full fledged Fleet Management System with a powerful suite of web based office tools. We have worked hundreds of hours with professionals in the agriculture indistry to include features key to running a successful agriculture commodities carrier fleet. Enter locations of pick-up or drop-off into your ELD/AOBRD log and the system automatically tracks air miles. Based upon your air miles, the system automatically makes appropriate log annotations, monitors HOS, or ignores HOS, per the regulation. 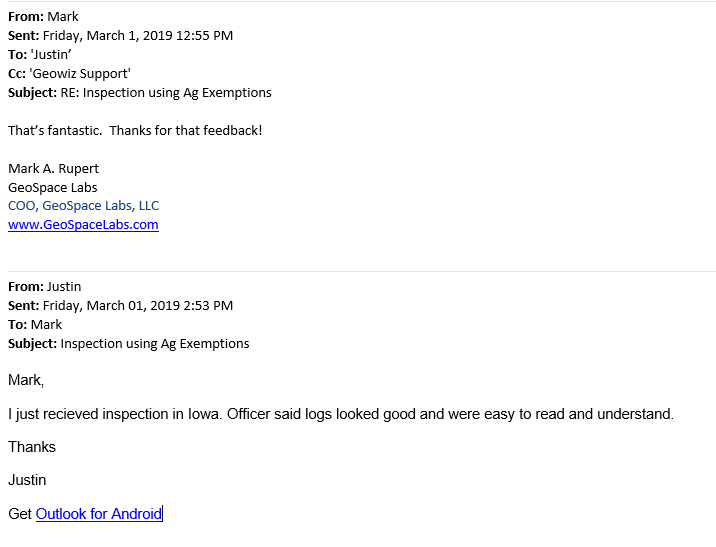 Provides Ag exemption details (not just status) to inspectors to prove exempt status. 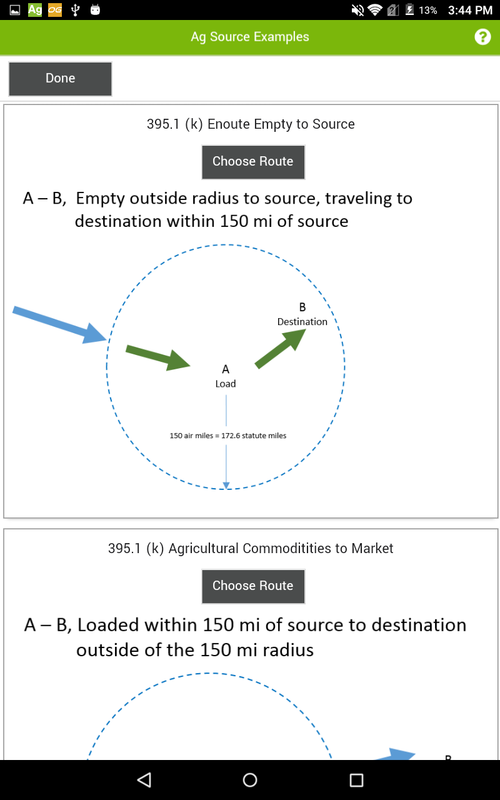 Draws exempt radius on the map on both the ELD and in the office. Tells you how far from the edge you are at all times. Watch haulers progress through their route, dispatch them, check idle time in real time, be notified of arrivals by email or text. 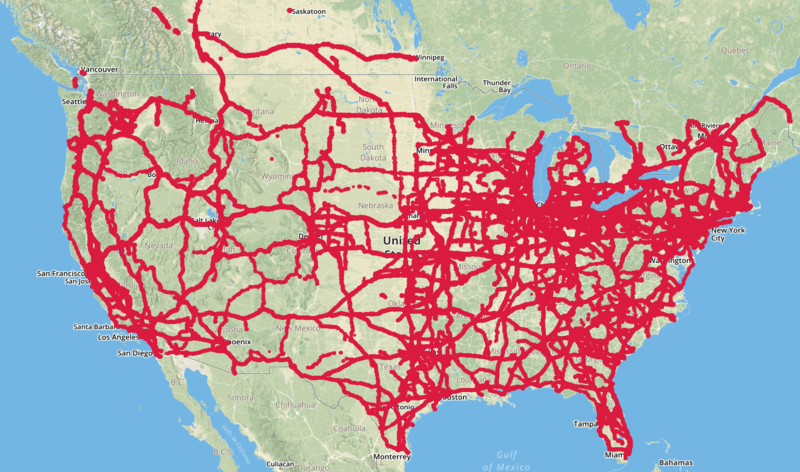 Manage route, dispatch, available hours, asset DVIR status, and track maintenance, fueling, and locations from an easy to use web portal. Know immediate about CSA point issues, and have the tools to fix them before they occur, or track their resolution before an audit. If running as an ELD, easily send RODS data to the FMCSA in approved electronic format and track send/receive receipts. The Geowiz ELD AG version runs on any modern iDevice or Android device and you can download it from the Play store or APP store. Used full time, the Geowiz app will consume about 150-250MB of data a month. Using the AG HOS system you will join a growing network of over 33,000 drivers and a system tracking over 170,000 assets. "This system is an excellent hours of service tool. We switched from another well known system and have been thrilled with the results. "When we got audited we were able to provide all the information necessary to have NO hours of service findings! "Its the little things the system does, showing us the edges of the AG exemptions, the easy 'Start My Day' work flow, that I like the best. "It works, is easy to use, and isn't very expensive. I can think of no stronger way to recommend it since we have to have one. "We didn't realize how far the air miles extended from our orange grove until we put it into the AG system, which saved us a lot of hassle. 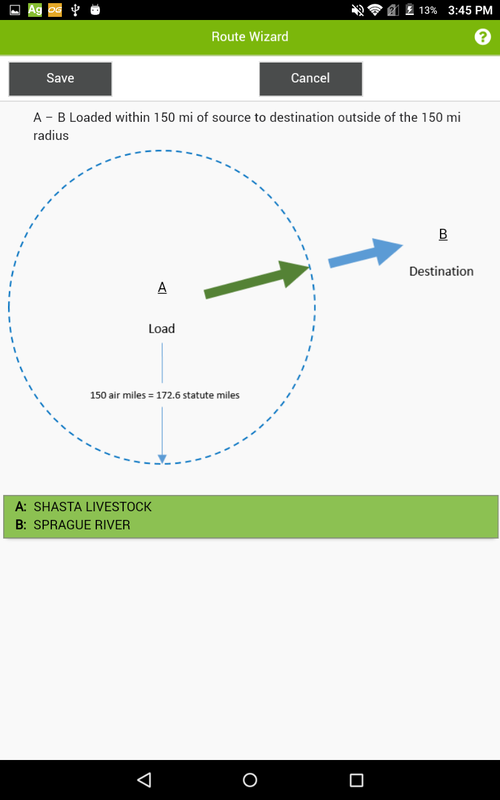 How does the ELD/AOBRD know where an agriculture location is? 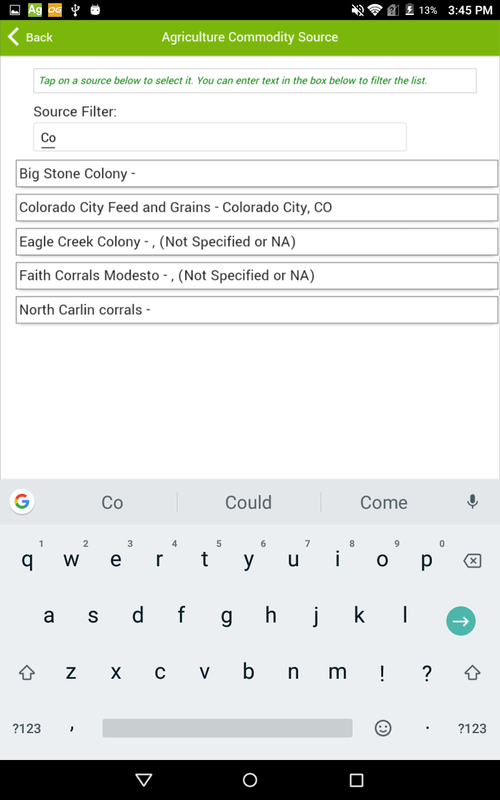 Via the easy to use interface either in the APP or the web console, agriculture locations can be entered, even if there is no specific street address. 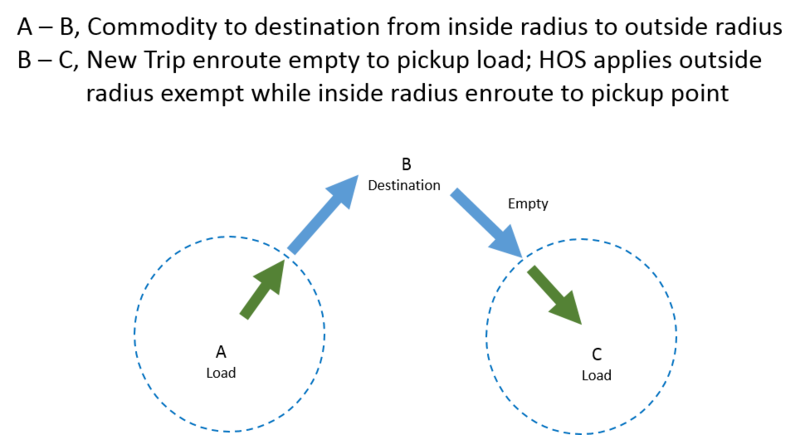 The system then performs what is called a 'reverse geocode' lookup and finds the corresponding latitude and longitude and stores the location to be used going forward. How do I identify an agriculture location as part of my hours of service? Once entered, all agriculture locations are available to be selected from a list inside the APP or via the web console from an office dispatcher. You simply identify the location you are interacting with and the ELD/AOBRD automatically calculates the air miles for the location, and also records your arrival and departure times from the location. Does it take note of the actual commodity I am hauling? Of course. You can enter your manifest number to correlate to your hours of service, and also enter the type of commodity specific to the location. Both are stored and presented at roadside inspection, or later in an audit. This way you have two pieces of supporting data, along with the actual system air mile calculations to prove exemption eligibility for each and every haul. What if I am hauling farm supplies? The system handles farm supplies in the same manor as commodities for wholesale or retail sales per the above answer. Does the ELD/AOBRD handle 'enroute empty to source'? Absolutely. 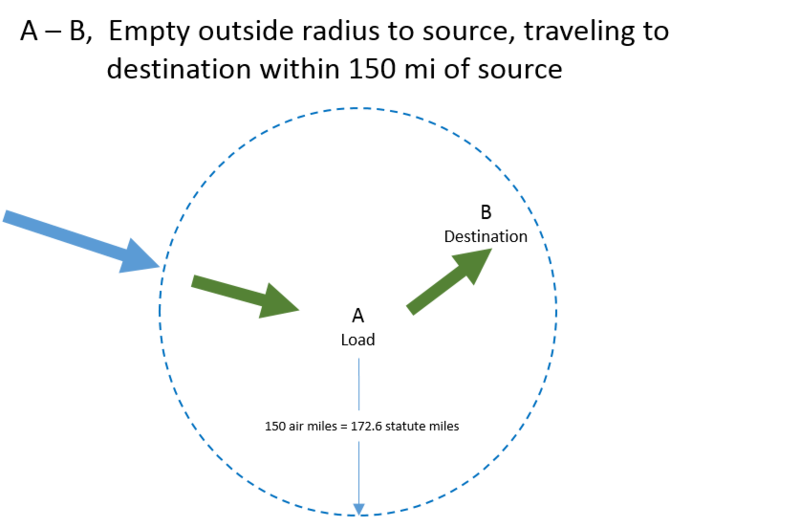 If starting outside the 150 air mile radius, the system tracks HOS per normal. 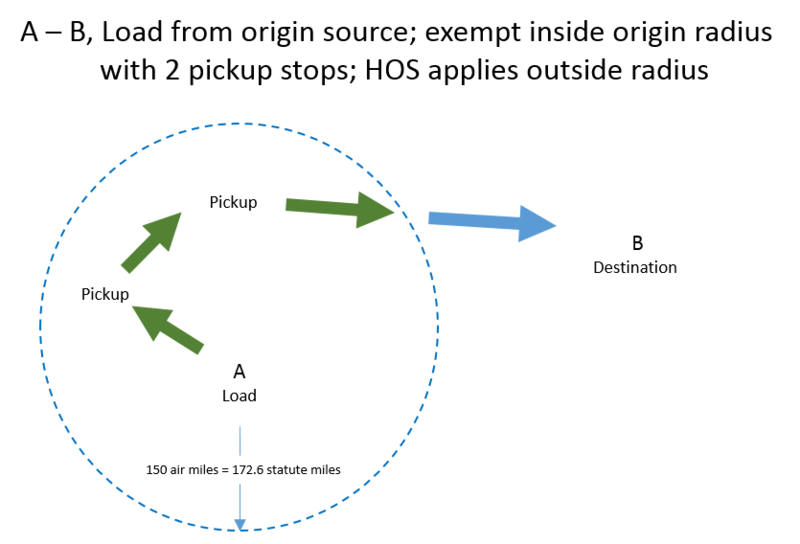 As soon as you enter the radius, all exempt hours are shown in green on the ELD/AOBRD graph and not calculated against HOS hours once inside the 150 air mile radius. It is all easy to follow and completely transparent so an inspector knows they can trust the data. 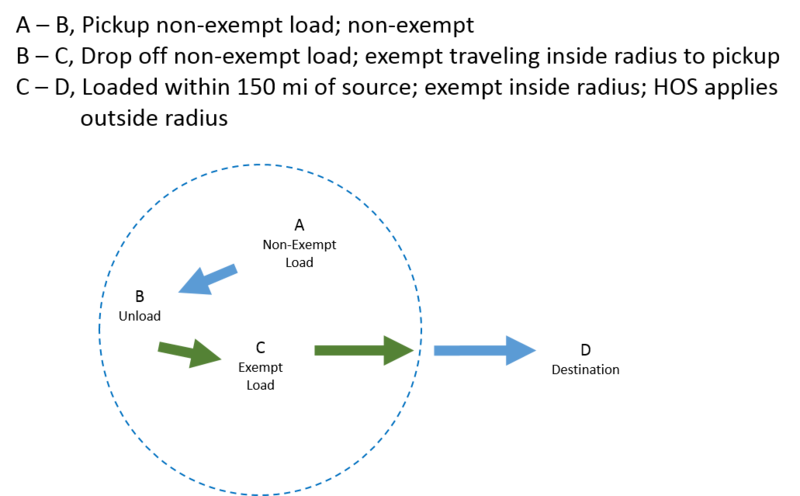 Does the ELD/AOBRD handle 'return empty to source'? Yes. 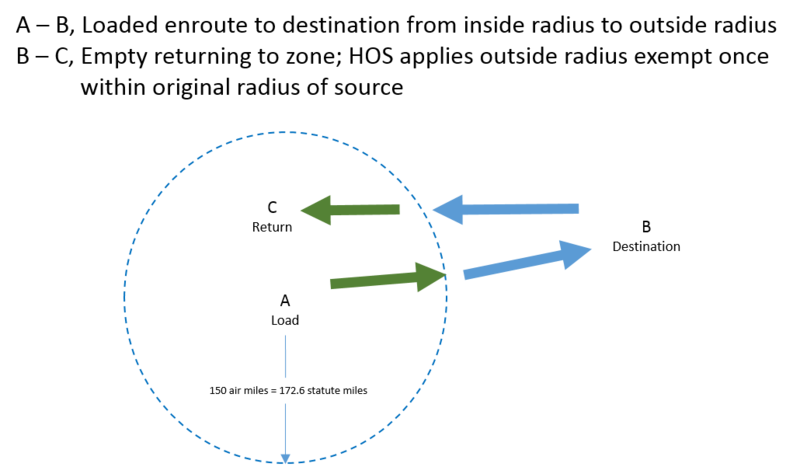 If the return starts outside of the 150 air mile radius normal HOS is calculated, then, upon entering the return radius all exempt hours are shown in green on the ELD/AOBRD graph and not calculated against HOS hours. Does the ELD/AOBRD handle multiple pickups/deliveries and trips not returning to the original source? Is the ELD registered with the FMCSA? Yes. Our ELD system is registered with the Department of Transportation/FMCSA. Our registration number is #0008. Do you offer phone support from the USA? Yes. Our support office is in Lakeland Florida and staffed by expert support personnel Monday through Saturday. The ELD/AOBRD has direct in APP support options to contact staff from inside the APP, and you can call our toll free number 1.877.4.GEOWIZ. Yes. Using our ELD/AOBRD puts you into a growing community of thousands of professional drivers, safety personnel, and dispatchers. Copyright © 2019 GeoSpace Labs. All Rights Reserved.